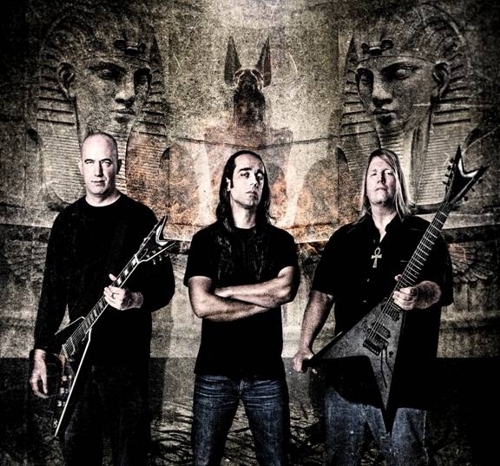 The reigning kings of technical, historically-themed brutality, NILE, will tour the United States once again this March and April with 28 shows supported by three of the best local bands in every market. NILE will play two massive sets with music spanning their prolific, twenty year career. Exclusive pre-sale tickets are available now at EnterTheVault.com. NILE’s seventh full-length studio album, At The Gate Of Sethu, was released on July 3rd and debuted on the American Billboard Top 200 album chart at #131. The album also secured the #2 position on the Billboard Heatseekers chart and #10 on the Current Hard Music charts. At The Gate Of Sethu was produced and mixed by Neil Kernon (Nevermore, Cannibal Corpse, Deicide). Cover artwork is by Greek artist Seth Siro Anton (Exodus, Soilwork, Paradise Lost). NILE will be performing on the 70,000 Tons of Metal Cruise in January 2013 and at Circo Volador in Mexico City on March 2nd, 2013.